There’s a fierce clatter of valve gear, as two large volumes of air and fuel get compressed and then ignited barely a foot away from my ear. As John wrings the throttle, the barrage of explosions increases and my heartbeat rises rapidly. The loud blat of the dual chromed silencers ricochets off the passing stone walls and resonates within my skull. I have gone through this moment a trillion times over in my head – I later realise that we had done in excess of 100 kph. This is not quite how I expected a 75-year old machine would be ridden! Brough Superiors, however, were built to be ridden that way – hard, fast and like every day was the last day of their lives – even hours after they rolled off the production line. Every SS100 would be flogged up to 160 kph (or 100 mph) before being sold to the lucky few who could afford the hefty price tag. 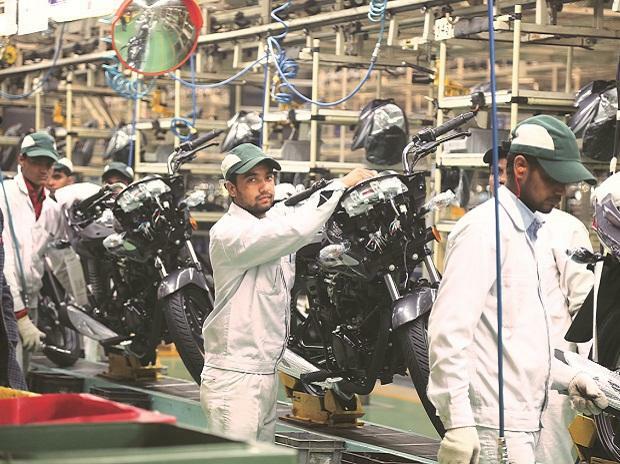 If the bikes couldn’t make the mark, they went back into the factory and started over from scratch. And the man behind the marque, George Brough, would certify every single one that made it through their test of fire. 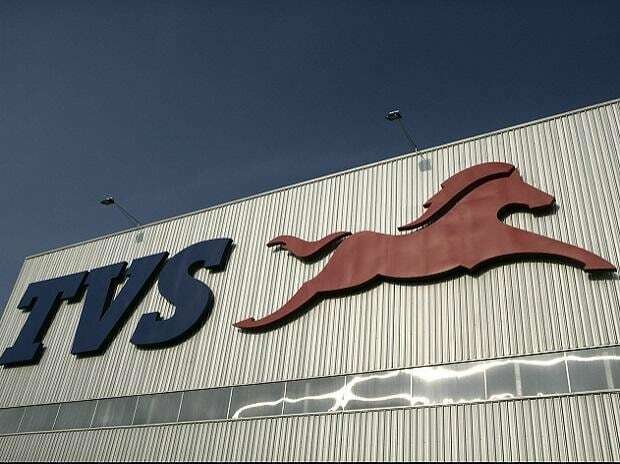 Yes, this was performance guaranteed; there was no place for second best in this Nottingham factory. George Brough was a remarkable man, who had a sense of theatre with everything he did. For example, his dad manufactured motorcycles, apart from other things, but George wanted his machine to be better than anything else around. As with many good ideas, young George got a good one in a pub – one night out with the boys, someone suggested to him that he ought to call his motorcycle the Brough Superior. George loved it. On hearing the name his son had chosen for his motorcycles, the old man reportedly remarked, ‘I suppose that makes mine the Brough Inferior’. One can only imagine what it must have been like around the dinner table that night! We chug into town and pull up to a stop light. It’s a nice and sunny Saturday morning. I’ve been told that the sun has come out after a long, long time and people are out to take in all that Vitamin D in T-shirts and shorts. The only encounter I’ve had with the motorcycle marque of my dreams was in a museum somewhere in Germany. There it stood, with a dented fuel tank, looking forlorn, as if it missed being on the road. I closed my eyes and could almost hear the roar of those exhausts even in the hushed silence of the room. My nose almost smelled the burnt oil and unburned hydrocarbons from the exhaust, the wind rustled through my hair as I flew down the metalled road, hands gripping tight onto the bars. 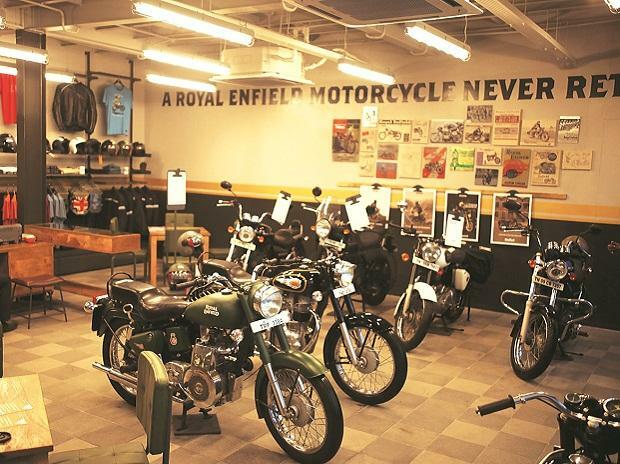 A sign told people to refrain from getting physical with the motorcycles on display. I couldn’t resist, I just had to have a photograph of me touching the machine that has dominated my thoughts so very often – call it an obsession, even. Yes, and I cherish that picture of me prodding the mudguard with my stubby index finger. The light turns green and John engages first and gently lets out the clutch. We surge forward and he keeps on going through the gears, till we’re in the top cog but doing a mere 30-odd kph. I half expect the bike to jerk and stall, but the SS100’s V-twin JAP motor will have none of that. I look at John with disbelief and he taps the tank with a smile and says just one word – torque. 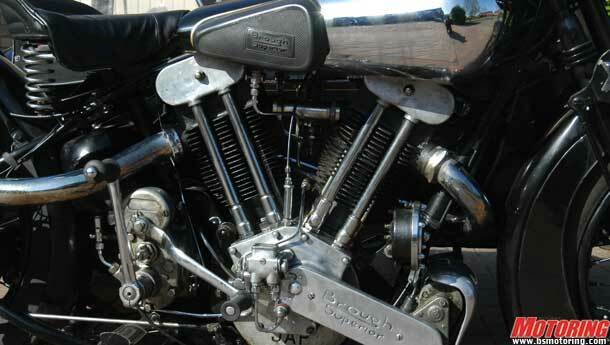 When one hears the name Brough Superior, many grand and chromed motorcycles come to mind, all of them solo machines. But here I am, encapsulated by some very old wood and steel, being pulled along with a very alive and well SS100. A sidecar, you presume? Well yes, that and so much more. You see, Mr Brough would settle for the best and not much else. So when it came to finally persuading the wives of his customers to ride along with them, a sidecar made sense. It kept the muck off the hems of their dresses and was effective protection from the elements. 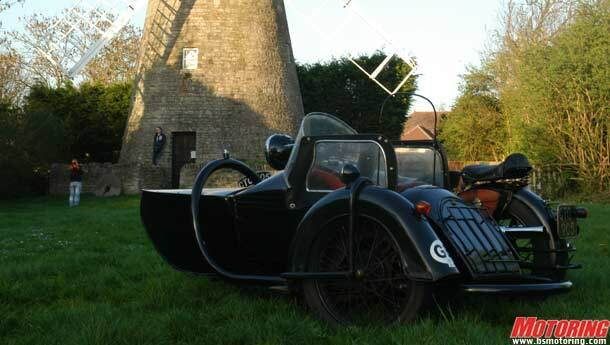 But this is no ordinary side car – it’s the Alpine Grand Sport (AGS) Cruiser outfit built by Watsonians. If you look closely at the tubular frame that supports the passenger enclosure, you will notice a valve at the top, just behind the ‘BS’ crest. And at the rear right bottom is another valve, with an arrangement to attach a pipe. When you were touring back in the day, you didn’t have the convenience of restaurants and fuel stations dotted along the way. While you could stock up on some grub and store it away in the compartment at the back of the sidecar, where would you keep the spare fuel? Why, in the sidecar, of course! You basically screwed open the BS crest (which also functions as a filler cap), poured the fuel into the pipe frame and screwed the cap back on. When the occasion arose, you simply pumped in some air using the tube-inflating hand pump, so that the fuel inside would get compressed, and then you attached a pipe from the rear bottom spout into your fuel tank. Voila! How do you build the ultimate motorcycle? Well, for one, you use the best possible components and then some. George did just that. He was paving the way for the rest to follow, and was hell-bent on simply making the best motorcycle money could possibly buy. So he picked up the best of everything. Various iterations of the SS100 were built, predominantly because this motorcycle was exclusive enough to warrant every one of them to be kitted out for individual customers. Also, the earlier ones were powered by the long-stroke, big bore JAP (not ‘Japanese’, but an abbreviation for the popular engine manufacturer ‘John Alfred Prestwich’ Industries) engines, while the later bikes ran with Matchless V-twin motors. As it is, Brough Superiors are as rare to come by as hen’s teeth, and it’s even harder to find an unmolested specimen that is on sale, irrespective of how deep your pockets might be. 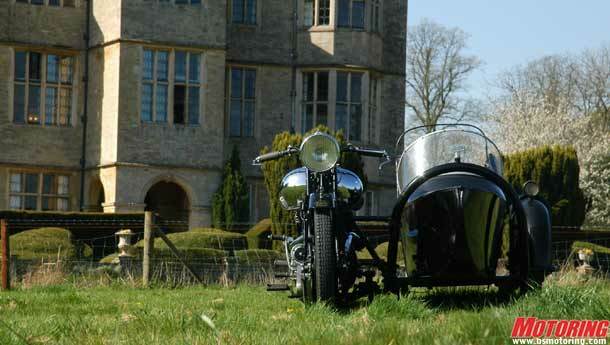 But John Wallis’s SS100 is a whole lot more special. His Brough is the one that sat in between a major transition in the Superior’s history. His is but one of the bikes that left the Brough Superior factory with a JTOR series 50 bhp JAP motor, cradled in a frame that was intended to be slung onto by a Matchless engine. Another departure from the norm (but factory fitted nonetheless) with John’s SS100 is the placement of the silencers – the ones fitted onto the JAP motors generally were stacked upon each other on the right hand side of the bike and not on either side of the motorcycle. Wait… did I just see perfect circles of smoke emerge out of the silencers? Oh, there they are again. I ask John whether I’m seeing things, but he says that it’s part of the charm of running the Brough with ‘carb-jector’ silencers. What they consist of is a strip of metal that runs in a corkscrew spiral all through the length of the pipes. Apart from the wonderful smoke trick, they also silence the engine’s exhaust gases on their way out of the pipe. This was a motorcycle bred for performance and you wouldn’t want one to suffer from oil starvation – a potential hazard that could have disastrous consequences. 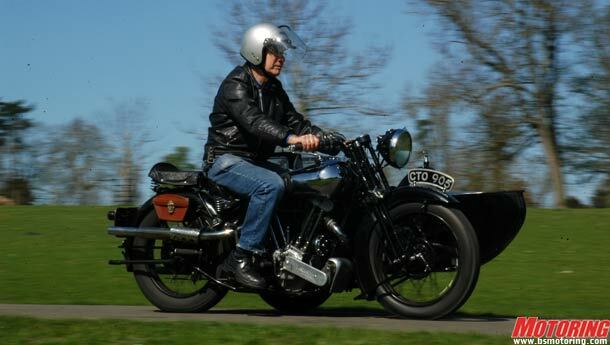 When John had picked up the bike from its previous owner, the SS100 had been modified to run a Sunbeam oil pump that was connected to a catch tank mounted onto the bottom crankcase. However, he has since fitted the original ‘Pilgrim’ type of pump that handles the oiling demands of the engine. However, when you are actually riding like the devils are on your tail, a lever on the handlebar pumps an additional squirt of oil into the engine, just in case. It’s like I’ve finally met my mythical beast – a live and fire-breathing one. I have waited many years for this moment and now, it has come to an end. 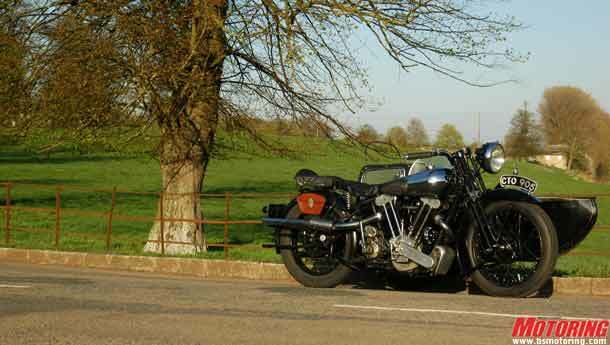 What will live on, however, are memories of my brief acquaintance with the mighty Brough Superior SS100. And I shall carry on forever the fact that one man can make a difference. One man’s perseverance can lead to a goal that is so highly cherished today, even after all these years. The power of one is indeed power enough.